Earn money through your EV charging station! eMotorWerks has partnered with MotionWerk, an Innogy Innovation Hub company, to launch an invitation-only release of Share&Charge peer-to-peer charging. The initial release was available to California residents in Q3 2017. We’re no longer accepting submissions. Сharging station operators set a price for the use of their JuiceNet enabled charging stations and allow other electric vehicle owners to utilize them. Charging stations appear on an interactive map, on which vehicle owners can search for available stations nearby. In the Share&Charge app, both charging station owners and EV drivers can see the prices before charging begins, and a secure Blockchain-enabled payment process is used for all transactions. The Share&Charge Wallet includes real-time information for tracking, monitoring, and security and provides an invoice for every transaction. EV drivers who participate in our California early release will benefit from free charging. This cost is covered by Share&Charge during the early access program! What is the Share&Charge program? This program is a preliminary evaluation of the Share&Charge model in California. 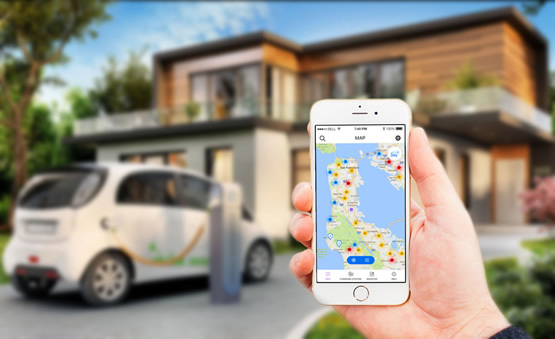 It allows both EV drivers and JuiceNet device owners to utilize a shared network of charging stations. Using the Share&Charge app, charging station owners can set a price on the use of their private stations. This model will create both greater mobility for electric vehicle owners and added benefits for owners of JuiceNet devices. Any California owner of a residential or commercial charging station that is easily accessible (e.g. not behind a locked gate!) and any EV driver wishing to utilize the peer-to-peer Share&Charge EVSE network. Which charging stations are eligible for the program? Is Share&Charge in use outside of California? Share&Charge has already been successfully established in Germany, and it already has over 1000 charging stations across the country. Just as it has done in Germany, this program will allow for both greater mobility for electric vehicle owners and added benefits for owners of JuiceNet devices across California. Am I liable for damages caused by a third party who uses my station? Damages may occur to charging stations, for which you should maintain adequate liability and insurance, e.g. homeowner’s insurance. How can I maintain my privacy while participating in the Share & Charge program? Only registered users will be able to see your charging station, if you wish to share it with others. My charging station is in my garage. Can I still participate in the program? Setting up the hours for the charging station such that someone is at home to grant access to it. Moving the charging station to a location with easier access. Running a cable with an appropriate plug out to a more accessible place. How many charging stations can I register? If you have multiple charging stations, you can register all of them. There is no limit. Can I register more than one car on my app? Yes, you can register more than one car. In the Share&Charge app, click on the car symbol on the map menu. Click on the small plus to add an additional car. You may remove your station from the program at any time by sending a removal request to franziska@motionwerk.com. Can I leave feedback on my charging station experience? Yes. Choose a charging station on the map in the Share&Charge app and click on “feedback.” You can leave feedback in the form of a star rating as well as a written review. How does billing work for charging? Can I set a different price on my charging station for family and friends? As an owner of a charging station you can set up different rates for community users and for family and friends. To add someone to the closed group, enter their email address into the Share&Charge app. Family and friends must be registered on Share&Charge in order to be added to the list.